Cataloochee Creek holds some great brook trout fishing, with plenty of fish from 7 to 10 inches long. 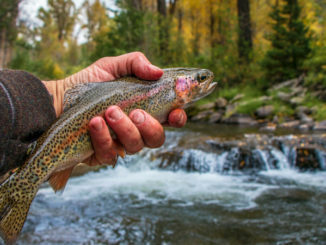 Few places exist where you can fish for trout with elk looking over your shoulder, and few streams in western North Carolina contain more brook trout than rainbows or brown trout. Cataloochee Creek in the Great Smoky Mountains National Park is such a place. Cataloochee Creek is in Cataloochee Valley, beginning at the junction of Palmer Creek and Caldwell Fork in Haywood County and flowing southeast and east for about 16 miles into Waterville Lake on the Pigeon River. 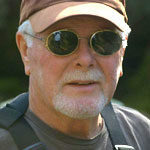 It is a mid-sized valley stream, with long stretches of still water interspersed with swift runs, ideal for fly-fishing. The stretch from the bridge near the campground to the bridge at the entrance to the group campground is the best fishing, most of it wadable. 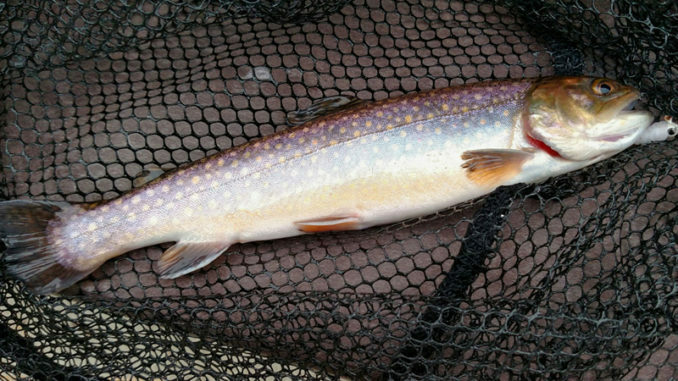 It contains most of the brook trout, and Cataloochee’s are larger than brook trout in other park streams, averaging 7 and 8 inches, with an occasional brookie up to 10 inches. Rainbows are in the same size range. Steve Moore, retired chief fishery biologist for the Park, rates Cataloochee as one of the best native brook trout streams in the park. Brook trout outnumber rainbow trout almost 2-to-1. Although one of the largest brown trout ever caught in the park — 321/2 inches long, 151/2 pounds — came out of Cataloochee Creek, brown trout numbers have declined in recent years. Anglers who frequently fish Cataloochee say they rarely see browns of any size. Elk were introduced in the valley in 2001, and they thrive in its lush, large, open grassy fields. The herd numbers around 60, and elk have free run of the valley, often wandering into the campground, to the dismay of some campers and the delight of others. Once native to the area, elk were extirpated in the late 1800s due to over-hunting and loss of habitat. Their introduction was one of the park’s more successful ventures in reintroducing native species. 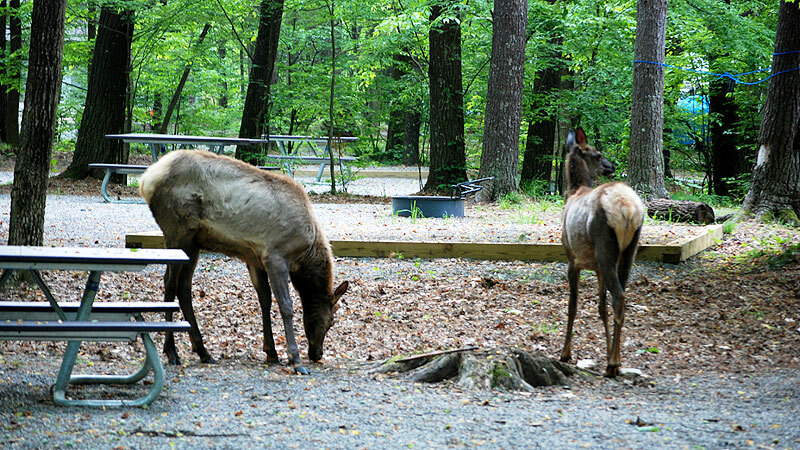 Elk are frequent visitors to the campground in Cataloochee Valley, which contains Cataloochee Creek. Best fishing seasons for Cataloochee and its tributaries are spring and fall. Terrestrials, particularly hoppers and inchworms, are very effective in late spring, early summer and early fall. Mayfly hatches are prolific in the spring. October is one of the prime times to visit the area. Not only are the fish biting, but the bull elk are bugling. Summer fishing is less productive but can be rewarding with patience. Elevation in the park is 2,600 feet, and with heavy bank foliage, the stream stays cool even in the hottest weather. Palmer Creek and Caldwell Fork, the two small streams that form Cataloochee Creek just above the campground, also offer good fishing. The fish, mostly rainbows, are small but plentiful. Cataloochee gets moderate fishing pressure, but Palmer Creek and Caldwell Fork get light pressure because most anglers prefer the big waters. The campground is one of the most popular in the park, primarily because of the elk. It is small, only 27 sites, and well laid out, with most sites providing adequate privacy and tall poplars, maples and oaks providing ample shade for all sites. The campground has no electric or sewage outlets. Each site has a large tent-pad, a fire-ring, and a picnic table. Fresh drinking water outlets are close to all sites. The campground has one comfort station with flush toilets. Sites must be reserved; walk-ins are not available at any time. Sites may be reserved by calling 877-444-6777 or online at www.recreation.gov. If sites are available, they may be reserved the same day of the visit. The campground is open from May 15-Oct. 27. Sites are $25 per night. The entrance road to Cataloochee Valley is not for the faint-hearted. It is a winding, narrow gravel road with steep drop-offs and no guard rails. Drivers may be required to stop or back their vehicles up to allow oncoming motorists to pass. Horse-trailer traffic also may be encountered on the road. The most direct route into the valley is Cove Creek Road. From I-40 west, take exit No. 20, go left 0.2 miles on US 276, turn right on Cove Creek Road and follow the signs about 11 miles to the valley, The access road is paved except for the last three miles. The road in the valley is paved.